If you were looking forward to updating your Windows RT tablet to the fancy new 8.1 update this weekend, it's time to start looking for a Plan B. Microsoft has temporarily yanked the Windows RT 8.1 update from the Windows Store due to "a situation affecting a limited number of users," as first reported by WinBeta. 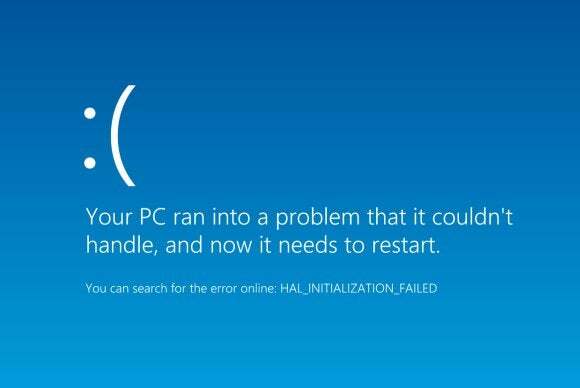 Microsoft didn't provide any further details, but it appears that people upgrading to Windows RT 8.1 are experiencing boot configuration data errors, which result in blue screens of death appearing on startup. Oops. If you downloaded the Windows RT 8.1 update before Microsoft yanked it and are suffering from a boot configuration BSOD, Kick That Computer has an illustrated, step-by-step tutorial in how to fix the problem. You'll need to have a bootable USB recovery drive for your tablet on hand, however, or have access to another Windows RT machine in order to create one. Update 10-21-13: Microsoft just released a Surface RT recovery image which you can use to create a boot drive and restore your tablet's Windows 8 installation to working order. The same Microsoft representative who admitted to the problem in an official support forum also said that the team is working hard to resolve the situation as quickly as possible. We'll let you know when more info becomes available. And for what it's worth, the Surface 2 tablets launching on Tuesday ship with Windows RT 8.1 preinstalled, so you don't have to worry about running into upgrade woes if you've already plunked down preorder cash for Microsoft's self-made tablet.